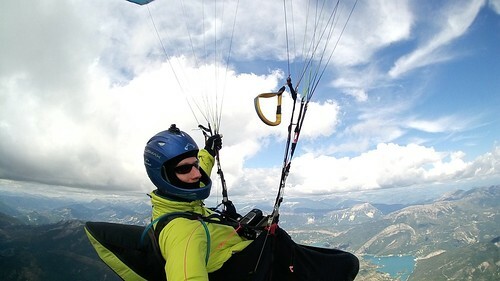 I’m Tim Pentreath and I’ve been paragliding since 1990 (I learnt with Dave Ward-Smith and Rob Stimpson down in Swansea) and have been flying Advance wings since 1998 when Gavin Foster sold me a second-hand Omega 4. I’d just won a round of the BPC in Snowdonia on my Nova Sphinx, and Gavin, never one to hold back, phoned me and persuaded me I needed to replace that old bag of washing! I had some great flights on the O4 and flew it for four years until Gavin said that he’d got a second-hand O5 that I just had to try. Sure enough, after a lovely day’s flying down at Putsborough (North Devon) I bought it… I kept it for seven years (I clearly enjoyed flying it) but changed it for a Sigma 7 in 2009, then a Sigma 8 in 2011, and thrn a Sigma 9 following my selection for the Advance Serial XC Team in 2014. In 2015 I flew a PB of 220kms from Milk Hill to Thetford – what a great day that was! You can read about the flight here. Earlier in 2016 I went all lightweight – I now fly an Omega X-Alps with a Lightness 2 harness and Companion reserve. With a total pack weight of approx 14kgs including helmet, instruments, water and sandwiches it really is a revelation, not to mention much better for my back! Please contact me by email, Telegram or call me on 07905 271114.